MorganStanleyGate: Gov. Rick Scott & Gov. Bev Perdue: Please Stop This MADNESS ! The handwritten message (reproduced below, along with logistics on how it was delivered) was concurrently sent to Florida Governor Rick Scott and North Carolina Governor Bev Perdue. It was drafted in the jail cell of Spencer C. Young during his UNLAWFUL incarceration on entirely FABRICATED charges, which were later DISMISSED as such. The essence of this message: This was another exasperated plea to stop the madness of jailing an innocent citizen who was a victim a grand larceny by the criminals who orchestrated his arrest. This is beyond bizarre and indicates entrenched kakistocracy. 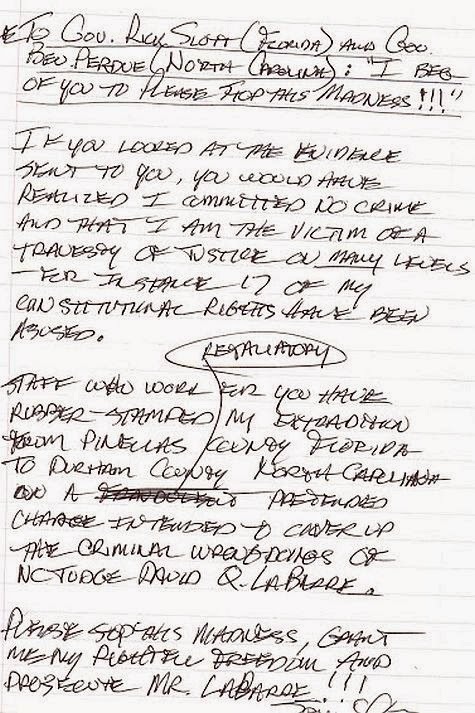 With the overwhelming evidence provided, this outrageous assault was obvious, thus BOTH Governors were knowingly complicit in this dastardly scheme resulting in 17 civil rights violations perpetrated against Spencer C. Young, who genuinely feared for his life if he was FRAUDULENTLY extradited from Florida to North Carolina. During the early stages of his WRONGFUL incarceration, it became clear Mr. Young's outgoing mail was not being delivered, so he hired a private investigator to meet with him during allowable visiting hours at Pinellas County (FL) Jail, During these meetings, he secretly handed off his handwritten messages for delivery via email, regular mail, messenger, etc. Everything that was sent was also uploaded to this website, with the ultimate goal of gaining his rightful freedom.